Wearing the blue berets of United Nations peacekeepers, 250 New Zealand Defence Force personnel are farewelled in Palmerston North (Warrant Officer Doug Walker is in the forefront of the photo). 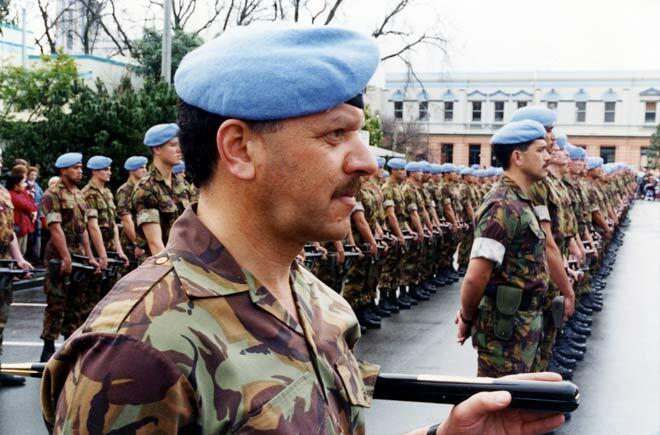 The troops were on their way to a conflict in what had been Yugoslavia, where they took part in the broad range of activities typical of peacekeeping. There was some doubt in New Zealand over involvement in this mission.